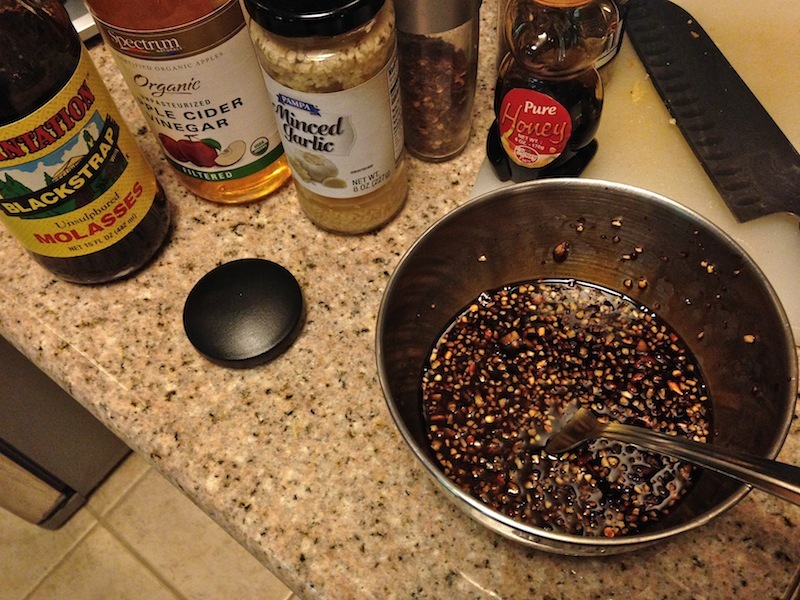 Facing My Fear of Molasses | Keep It Up, David! I faced one of my fears, guys, and I lived to tell about it. It’s probably one of the sillier fears you’ll hear about, but I’m not ashamed. I was afraid of molasses. It’s simple: Molasses can kill you. And I’m not talking about calories or diabetes or unhealthy living. I’m talking about drowning. Yes, drowning. It’s already happened once in this country, on a horrific scale. The first time I heard about the event I’m about to describe was a few months ago, from my friend Jake, and since then I’ve had a couple nightmares about it. I wish I was kidding, but I’m not. A hundred years ago, molasses was a huge commodity. It was the standard sweetener of the day, and in addition to being used in kitchens across the country, it was used to make ethanol, which in turn was used to make ammunition, which had been in high demand, thanks to World War I. The huge demand for molasses prompted the Purity Distilling Company to build, in 1915, an enormous molasses storage tank near the waterfront in Boston. Huge is an understatement: the tank was 5 stories tall and 90 feet in diameter. It could hold 2.3 million gallons of molasses – enough to fill an Olympic-sized swimming pool three and a half times. On January 15, 1919, the tank was filled to capacity, its contents awaiting transfer to train cars that would take it to a refinery. Around lunch time, the air was filled with what sounded like machine-fun fire. In actuality, it was rivets popping from the tank. Soon after, the tank collapsed altogether, unleashing over 2 million gallons of molasses upon the city. A makeshift hospital was set up a half mile away, and volunteers raced to clear molasses from the noses and mouths of victims so that they could continue breathing. Horses that were slowly drowning were shot, to be put out of their misery. Search and rescue operations continued for days, and the body count continued to rise. In total, 21 people were killed by molasses. Two of them were 10-year-old children. Another 150 were injured. Since reading up about the Boston Molasses Disaster of 1919, I’ve had a couple nightmares about molasses. Specifically, I’ve dreamt of being overcome by a growing puddle of the sticky brown goo, or slowly sinking into it like it was quicksand. It was time to face my fear of molasses and move on. RELATED CONTENT: I Like Incorporating History Into This Blog. Check Out My “Cardio To Vegas” Series For More Posts That Combine History With Health! So, I bought that bottle of molasses pictured above. I’ve never bought molasses before, nor have I ever seen it or tasted it by itself. I’m sure I’ve eaten food made with molasses (like cookies and other baked goods), but never in my own home. Having molasses in my cabinet was a first. Start with two and a half pounds of veggies. You could use whatever you want, or whatever you have on hand. Just make sure, no matter what you use, that you chop them so they’re about the same size, so they cook evenly. 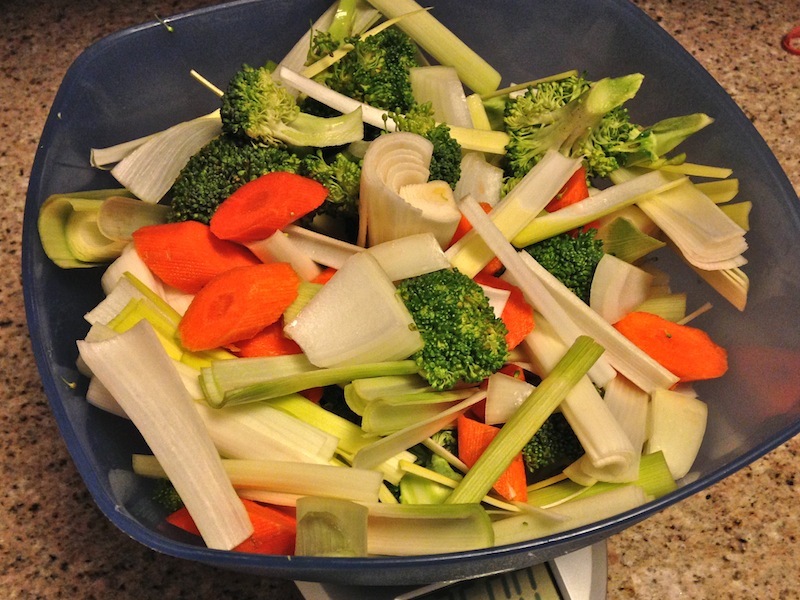 I had gotten some beautiful carrots, broccoli, onions and leeks from the LA Salad Company, so I used those. 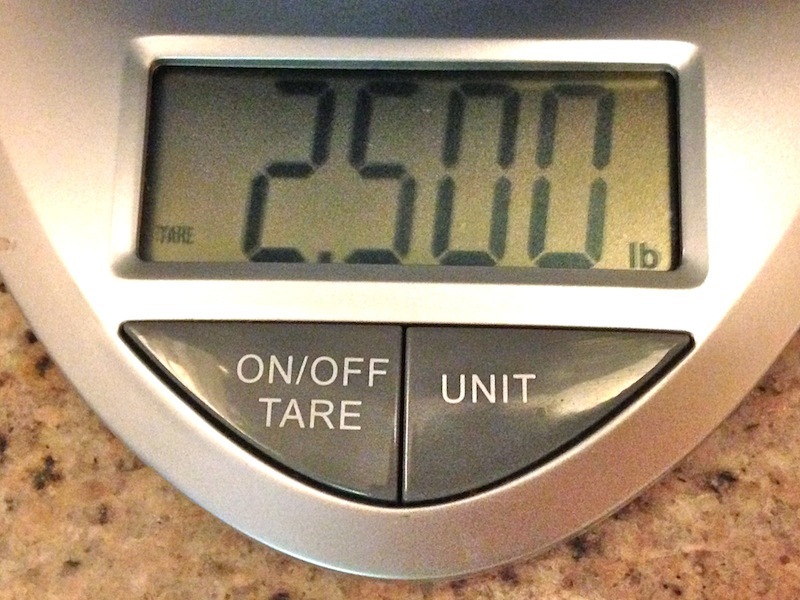 Look, I got it to exactly 2.5 pounds! Next, make the glaze. 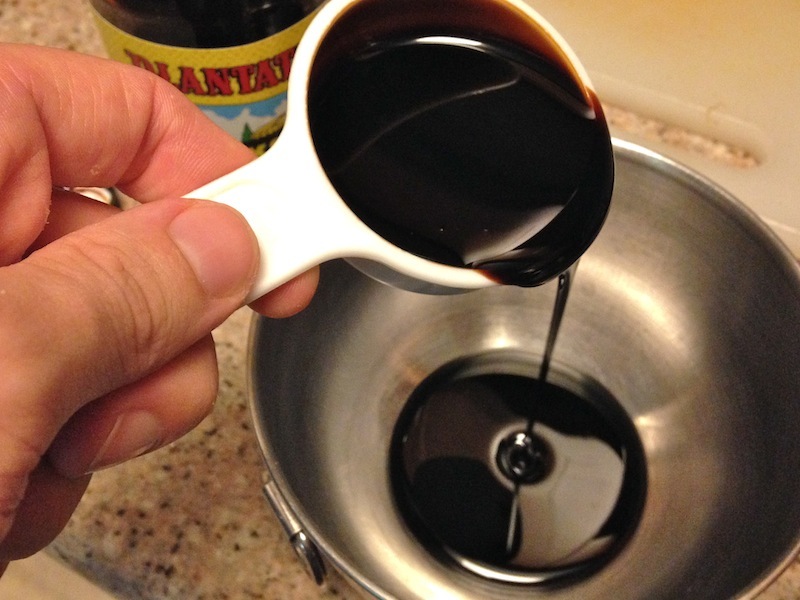 Start with 1/2 cup blackstrap molasses. I tried a little bit of it on the tip of my finger as I was measuring it out. It’s definitely sweet, and very thick and rich, but there’s also a touch of bitterness, too. I’ve never tasted anything like it. RELATED CONTENT: Lots More Recipe Ideas On My Recipes Page! 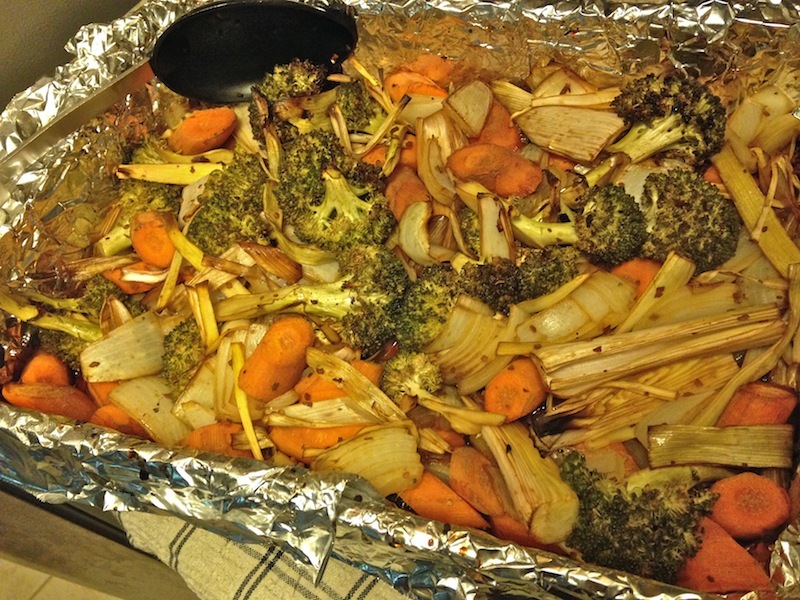 The veggies were delicious: tender, flavorful, and a wonderful mix of tangy, spicy, and sweet. I could eat these all the time. 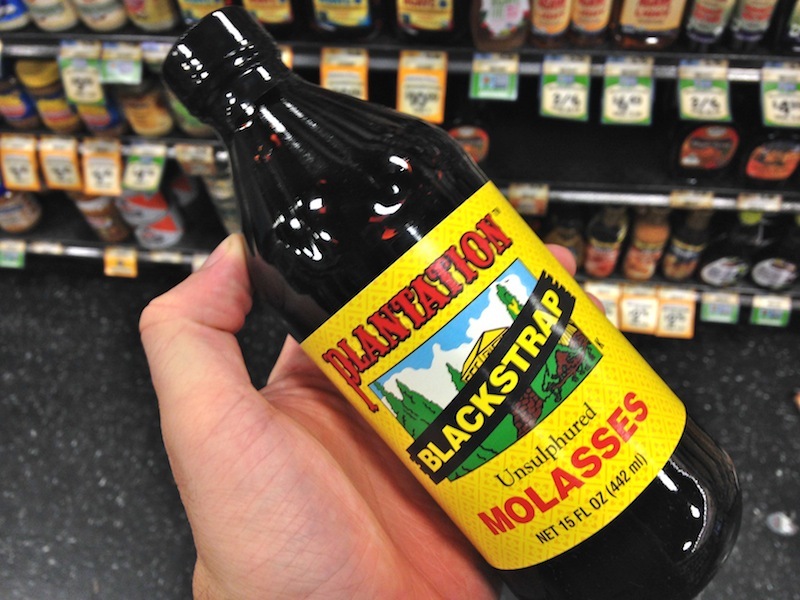 The best part is that blackstrap molasses is actually rather nutritious – it has the most minerals and nutrients of all the various grades of molasses on the market. It’s a great source of potassium, iron, calcium, magnesium, manganese and copper. It’s also a natural stool softener, so there’s that, too. 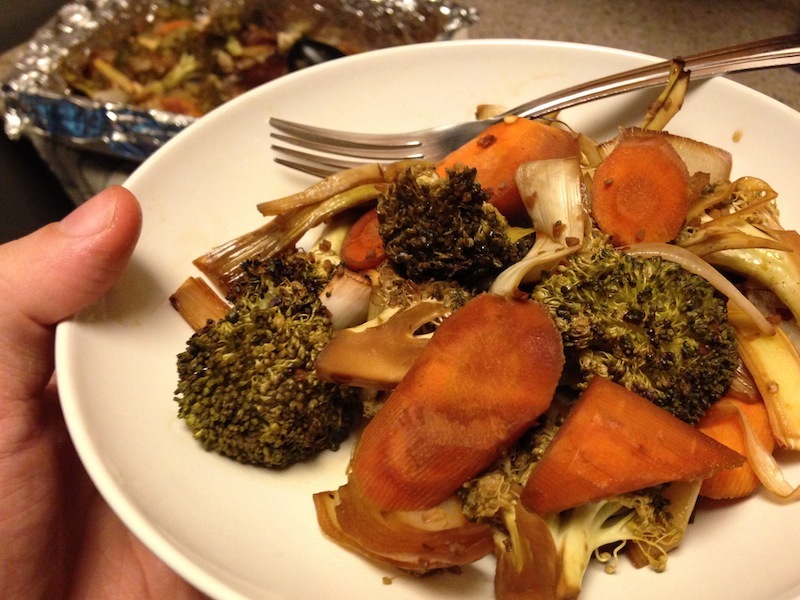 A tablespoon of blackstrap molasses has 42 calories and is fat-free, so my entire pan of roasted veggies only had 336 calories from the molasses I used. Next I want to try glazing brussel sprouts with molasses. Oh boy, does that sound good or what? Lastly, I should confess that I made this dish over a week ago. Since then, I’ve have no molasses-related nightmares! This entry was posted on Tuesday, October 21st, 2014 at 3:41 am and is filed under Uncategorized. You can follow any responses to this entry through the RSS 2.0 feed. You can leave a response, or trackback from your own site. Well, that was interesting. I’m at the beach in Dana Point walking lots of stairs up and down to it. Do you do any warm up for your knees? Thanks! I always stretch before climbing to get my knees (and the rest of my legs) nice and loose, and sometimes I’ll jog a block or two, but that’s more to get limber and start getting my heart rate up. A history lesson disguised as a recipe…brilliant! Hadn’t heard about the Boston molasses flood. Perhaps you should do a whole cookbook of recipes paired with industrial accidents?? All the best food is Dangerous! Yikes! If there’s a deadly food or beverage-related flood every 100 years, it means we’re due for another any day now!